In Poland lots of people have sour cherry trees in their backyards. So did my parents. The two lovely trees which used grow next to our house, were giving us beautiful cherries. I could never wait for the first fruit to appear. I’m not a fan of very sweet fruit in general, so I truly enjoyed their slightly tart flavor, eating the cherries either fresh alone, or cooked in desserts. I loved to pick the cherries into large bowls to use them later in my favorite sour cherry cake which I would bake with a recipe given to me once by my aunt. Sour cherries are juicier and more flavorful than their sweet cousins, which makes them perfect for desserts and baking. Not to mention, sour cherry jam, juice, and yogurt…something that it’s easily available in every grocery store in Poland. Delicious!!! In Quebec, on the other hand, sour cherries are very hard to obtain. So, when I saw a package of the sour beauties in the Eastern European grocery store a while ago, I just couldn’t resist them. I missed sour cherries so much!!! I was a little disappointed there was only one little package left - there wouldn't be enough cherries to bake my aunt’s cherry cake, I thought , and decided to keep them frozen for late use. I realized I still have them in the freezer only last week when I was planning to make an almond cheesecake. Aren't cherries and almonds a perfect combination of flavors? Well, for me they surely are. So, I decided to make an almond cheesecake with sour cherry compote. I used mascarpone cheese and fromage frais and added grounded almonds and amaretto liquor for the almond flavor. 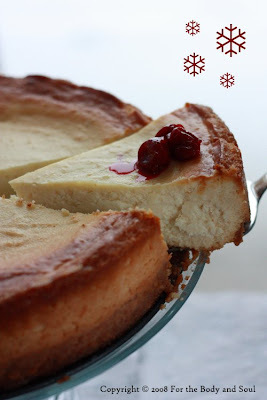 For the bottom of the cheesecake, I made amaretti crust from this recipe. Since I’ve never made compote before, I had to read a few recipes like this one and this one before I could actually make one myself. Not very sweet itself, together with the compote, the cheesecake was simply delicious. The almond and cherry flavors make it a perfect cake for the holiday season. 1. Preheat the oven to 170 °C. 2. In a food processor combine amaretti cookies, toasted almonds and sugar. Add melted butter and mix. Press crumb mixture evenly over the bottom of slightly greased springform pan. Prebake for about 10 minutes. 3. Using an electric mixer, at high speed beat the eggs and sugar until pale. At low speed beat in mascarpone cheese and quark cheese, a few spoons at a time. Add cream, amaretto liquor , lemon juice, lemon zest, and grounded almonds, one ingredient at a time, mixing well after each addition. 4. Place the filling on the prepared crust. Bake for 1 hour. Remove the cheesecake from the oven and immediately run a thin knife around the edge of the cake. Let stand for 5 minutes, then return to the oven and bake for 15 minutes more. Remove from the oven and let cool. Refrigarate for about 3 hours. Serve with the cherry compote. Place the water, lemon juice, amaretto liquor and sugar in a medium saucepan. Bring to a boil over high heat stirring until the sugar dissolves. Boil until thin syrup forms, about 7 minutes. Reduce the heat to medium and add cherries. Cook until desired consistency ( it’s up to you whether you keep your cherries whole, or let them break slightly). Let cool, then cover and chill in the fridge. The compote keeps in the fridge for about 1 week. Happy new year :) Still following your blog, and now I have an issue I think you could advise me on: I am making pancakes with the polish raisins/curd cheese filling. Which cheese could you suggest as a substitute for twaróg? Quark? Fromage frais? Among the two, I'd opt for fromage frais. Also, fresh ricotta cheese would make a nice substitution. Let me know how they turn out. Thanks for the comments and happy New Year to you too!! !